The night sky is, without a doubt, one of the most amazing sights in nature. All of us at sometime have wondered 'what's out there' and perhaps you have wanted to know more about it. Maybe you've seen programmes on the television or read books or noticed information and beautiful pictures on the Internet. Maybe you been lucky enough to look through a telescope and saw the stunning view of the Moon or another planet, some distant world in the far reaches of the Solar system, or gazed in awe at a star cluster or nebula, or even a far distant galaxy. Surely you have wondered what is out there and perhaps asked yourself how you can see and understand it better? Maybe you decided it was all a little too difficult and 'scientific'? Well, I'll show you how to unlock the secrets of the night sky and give you insider knowledge about objects in the heavens and give you the tools to understand why and how we see things as they are and even how to see them better. 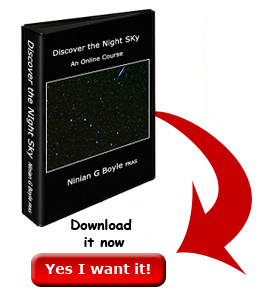 Using video, animation and breath-taking images from professional and top amateur photographers and text in clear English, I will show you the wonders of the night sky in an easy to understand format which will have you wondering why you ever thought it was difficult to grasp. You will easily absorb the information, presented in modules, which you can jump between and quickly scan for the items you need later on, should you ever start to observe the stars Moon and planets with binoculars or a small telescope. So if you are new to the subject, or just a little unsure about terminology, or how it all 'works', then this course is absolutely for you. How can I easily find my way around the stars and constellations? How do you read a star chart? Why do the stars seem to change week by week and month by month? What causes the phases of the Moon and why can't we see the 'dark side'? Why does the Moon sometimes look so big in the sky? What is the difference between a galaxy and a nebula? What are RA and DEC? Is there a difference between a comet and a fireball? When I first started out in astronomy I had to learn all these things the hard way! I've spent hundreds of hours using telescopes and digging through libraries and thousands of pounds in buying equipment to learn everything I am going to tell you so you don't have to take all that time and spend all that money! My name is Ninian Boyle and since the age of seven I have had a passion for astronomy that was sparked by reading a book by Patrick Moore (now Sir Patrick!). When I grew up, I started a company selling astronomical telescopes and accessories that in over 15 years grew to become an internationally recognised and respected supplier of this equipment. I became a Fellow of the Royal Astronomical Society some years ago having been nominated by no less than Sir Patrick himself, and I am a member of the British Astronomical Association. As time permits, I give lectures on various aspects of astronomy and equipment to astronomers, both beginners and more advanced, far and wide, and have made appearances on BBC local radio and commercial stations and lecture to the public at 2 different Planetariums. Finding that I kept being asked the same questions over and over again, I started to run a night class at my local Planetarium. I realise you can't necessarily get to where I am in the world, so I decided to make these courses more widely available on the internet - and to stop my wife complaining about being an astronomy widow! RA and DEC explained at last! Astronomy is a fascinating and complex subject. My wife and I decided to do the course before spending our hard earned cash on equipment. We learnt what we needed to know thank's to Ninan's 40 year's of experience, and excellent presentation. We even understand RA and DEC now thanks to the fantastic animation! 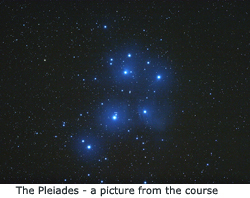 We can thoroughly recommend the e-course to all novice astronomers. A very informative and most enjoyable course. A must for anyone interested in astronomy. "I don't understand how the phases of the Moon work, we were never shown at school". To be honest I was horrified. The person concerned was quite adult and very intelligent. So, using a simple model of the Earth and Moon and a torch which took the part of the Sun, I proceeded to explain exactly how and why we see the Moon at different times and in different parts of the sky. I received a heart-felt 'thank you' and a nod of understanding. Don't get me wrong, I wasn't bothered by the person's lack of knowledge, after all that was what I was there for, but I was concerned that 'school' had been so lax in not explaining one of these everyday scenes of nature. What else had they left out? I've been 'doing' astronomy for over 40 years now and I know that I still have a lot to learn. In the beginning I didn't know where comets came from, or what caused a total lunar eclipse. I didn't understand 'precession' or know how to quickly work out which constellations were where in the sky. This comprehensive course clearly explains all you need to know to get you started on your journey of discovery of the exciting hobby of astronomy. Finally understand those difficult celestial co-ordinates so you can find objects to view quickly -- watch a simple animation that makes RA and DEC easy! Grasp many of the concepts of modern cosmology without the fear of not understanding mathematics! Learn in your own time -- no-one's checking your progress! Save yourself a heap of CASH not buying the wrong books or courses which are either impenetrable or just plain boring! Learn to use simple aids to find your way around the stars. 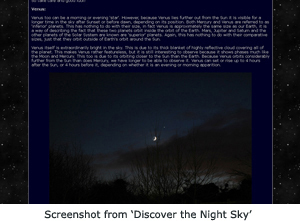 So if you've always wanted to learn about or learn more about the wonder of the night sky, all you need to do is get 'Discover the Night Sky' and get going. The pictures will take your breath away. The animations are clear and concise and the videos are short and friendly. Studying this course will take you to the next level with you interest and will have you feeling confident and competant with terminology and many of the concepts of astronomy. So, why didn't I just write a book? Because with the online e-course I could pack in loads of these pictures and animations and video to help clearly explain some of the concepts that are just plain difficult to do in print. Here's the best news of all: you can take advantage of an extraordinary offer. This course was many months in the making. Because I love astronomy so much, it really wasn't a hardship, but it was a huge time commitment. I spoke to lots of beginners to find out what they needed to know and asked questions of friends online to discover what you were finding difficult. I went back to my books and trawled the internet into the small hours, and drew heavily on all my years of experience to gather together all the information you need into one place to provide you with a wealth of information. Then, I fired up my computer and began to write and produce the videos, animations, diagrams and pictures that make up the course as I want it to be a truly valuable guide for YOU, the budding astronomer and frankly I'm proud of the result! So, you now see why my family thinks I should be selling this resource for a very high price. They know how much time, thought and effort went into it. And they know that people pay me over $200 to teach all this at my nightclass. ...so you can download this amazing information packed course fro a while longer, not for the $137 price tag, but for a mere $97. Imagine being able to try out the course without any risk. Now it's a reality! 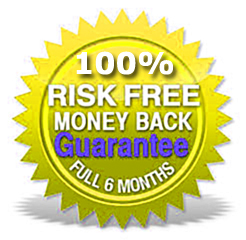 I am so confident that you will find this online course useful and that it will teach you so much to ensure you have many productive hours of observing that I am prepared to offer you a FULL MONEY BACK GUARANTEE for 6 whole months! That’s right, you have 6 months to study and evaluate the online course and if at the end of that time you can honestly tell me that you have not learnt anything useful I will give you your money back in full and close the course, no quibbles! Remember you still keep the bonus and the information packed course notes even if you claim your refund! Start Studying Your Online Course Now! 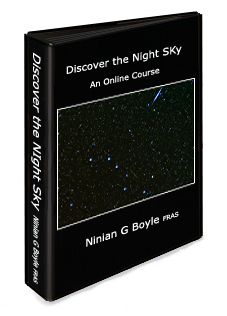 Claim your copy of Discover the Night Sky Online Course now along with your course notes and FREE bonus worth $137 for the special price of only $97.00. I've decided to keep this offer running for a little longer, but please grab it while you can at this price because it is likely to go back to $137 very soon and you will have missed the opportunity for ever! My friends and family will probably be happier knowing that I have retained my sanity but your opportunity to get this valuable information at this fantastic price will have passed. So download your online course now - I'd hate you to miss out! You can start right now learning with confidence to becoming an enthusiastic and competent amateur astronomer armed with all the tools you will need to go forward with this fascinating hobby! © Ninian G Boyle. Astronomy Know How. 2012 All rights reserved.